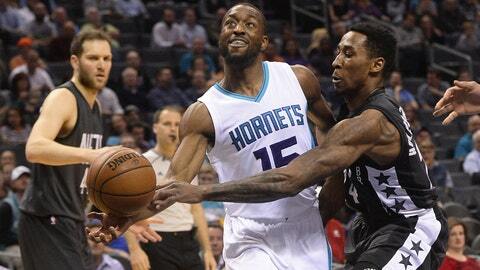 The Brooklyn Nets were narrowly beaten by the Charlotte Hornets, 111-107. Nicolas Batum dominated for the Hornets while Bojan Bogdanovic notched the most points for Brooklyn. This was the Brooklyn Nets’ second trip to “Buzz City” this season, with their last visit resulting in a loss as well. Charlotte had been free-falling, coming into this matchup having lost their last seven games. Their last win had come against Brooklyn on January 21st. Want your voice heard? Join the Nothin’ But Nets team! The Nets were also in the midst of a rough patch heading into Tuesday night’s contest. They were riding a nine-game skid as they marched into the Spectrum Center. The team was met with a glimmer of good news early Tuesday, as it had been announced that Chris McCullough will be representing the Long Island Nets in the D-League All-Star Game. Michael Kidd-Gilchrist, who has been infamous for his unorthodox shooting form, surprisingly kicked the game off with two smooth jumpers. In the following minutes, both teams went stone cold offensively. The Nets in particular started off the night shooting an unacceptable 2-of-11 from the field. Kenny Atkinson’s starting lineup as of recent has included Spencer Dinwiddie and Rondae Hollis-Jefferson, both of whom do not require a lot of attention on the offensive end of the floor. Charlotte’s offense began clicking as the quarter trudged on. The Hornets went on a 12-0 run to open up a double-digit lead halfway through the first. During this run, the Nets’ notorious ball security struggles continued, as they committed four total turnovers in the first. Brooklyn failed to improve their scoring woes by the end of the first. They shot 6-of-22 from the field and a measly 2-of-7 from the behind the arc in the opening quarter. Charlotte led after 12 minutes, 24-16. Finally, at the nine-minute mark of the second quarter, Justin Hamilton notched the Nets’ 20th point. Yet, feeding off of the hot hand of Jeremy Lamb, the Hornets were able to maintain a double-digit lead. The Nets’ lack of a reliable ball handler in their second unit showed once again, as they often looked lost offensively in the first half. They made little progress to cut into the double-digit lead that Charlotte had built earlier in the game. Brooklyn continuously looked to Brook Lopez for a spark, yet he only shot 1-of-6 from the field in the first half. The Hornets, led by Nicolas Batum, built a 54-37 lead going into the locker room. This is the lowest total the Nets have scored in a half this season. Brooklyn had a rare stretch of superb defense to begin the second half. Lopez upped his block total to four on the night, while keeping a possible comeback for his team within reach. Randy Foye took over point guard duties, which ultimately benefited his team. The Nets were able to cut the deficit to seven. Then, Lopez began to do what he does best. The Stanford alum knocked down a triple and chipped in a couple of smooth shots from the low post. This, in combination with Lopez’s teammates feeding off of his offensive versatility and dominance, led to the Nets increasing their field goal percentage to 38 percent. An element of communication and cohesiveness was lost when the Nets’ second unit entered the game in the third. The wing tandem of Jeremy Lamb and Batum led Charlotte to another commanding lead heading into the fourth quarter. With Isaiah Whitehead, Joe Harris, and Sean Kilpatrick on the floor at once, the Hornets’ long wings were able to abuse the Nets on both sides of the ball. Charlotte held an 81-72 lead after three quarters of play. Charlotte’s once-daunting lead was cut to four midway through the fourth, putting Brooklyn in prime position to connect on a knockout blow. Atkinson trotted out his starting lineup, plus Harris for the final minutes of regulation. However, in true Nets fashion, their defense began to implode down the stretch. Despite one last effort, the Nets ultimately fell to the Hornets. This was Brooklyn’s final meeting with the Hornets this season. Charlotte takes the season series, 3-1. The Nets fall to 9-43 on the season, while the Hornets improve to 24-28. Brooklyn will return home to take on the red-hot Washington Wizards on Wednesday.